It struck me that this might be a good way to think about language. It’s a flexible, complex system that reflects reality, and which both shapes and is shaped by the society in which it’s used. I guess you could also think about the developmental stress hypothesis (see Anne’s post) in this way, although Azad is a far more overt and enforced measure of fitness than language or fluctuating asymmetry. Not that this idea is new – Banks mentions that the langauge of the empire is deeply interlocked with the game, and Banks came up with this idea in 1979! Why is it that art so often seems ahead of science (I’ve already submitted a piece of work inspired by Banks’ prequel, Consider Phlebas)? It’s only a metaphor, but if it helps get you out of the mindset of language as primarily an innately endowed behaviour, then it might be a good thing. Oddly enough, this concept has already been commercialised. 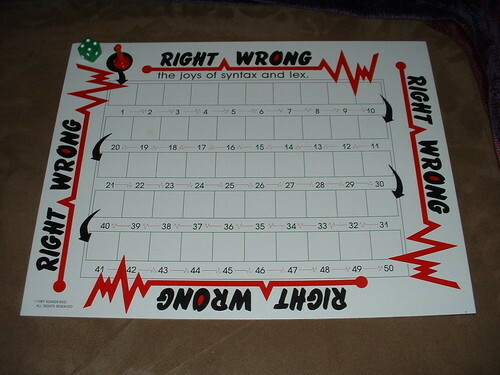 Right-Wrong: The joys of syntax and lex is essentially snakes and ladders with grammaticality judgements instead of a dice. “Each player attempts to answer ‘right’ or ‘wrong’ when read a sentence from one of 500 question cards. E.g. She added LOVAGE to the stew on the stove.” The example turns out to be correct, since lovage is a herb, not a badly inflected euphemism. Seems a bit prescriptivist. Yes, that has always been my dream. I can’t help the feeling that this is some kind of right-wing fundamentalist propaganda. 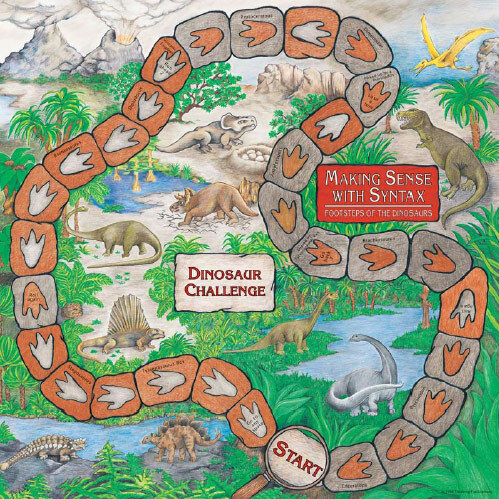 Grammar learning: The natural environment of the dinosaurs.